A hand painted Stag Dressing Table with Cath Kidston ~ Bird Design draw knobs. This is a great size and with fantastic storage capability this piece could also be used as a sewing/craft station. Autentico Sealant has been utilised to seal and protect. As this unit has been hand painted there may well be signs of texture, so it is not for someone looking for a factory finish. This is a charming and elegant piece, a definite show piece for your home. As a preloved character set it has the associated knocks and dings that vintage and reclaimed furniture picks up from age and use. 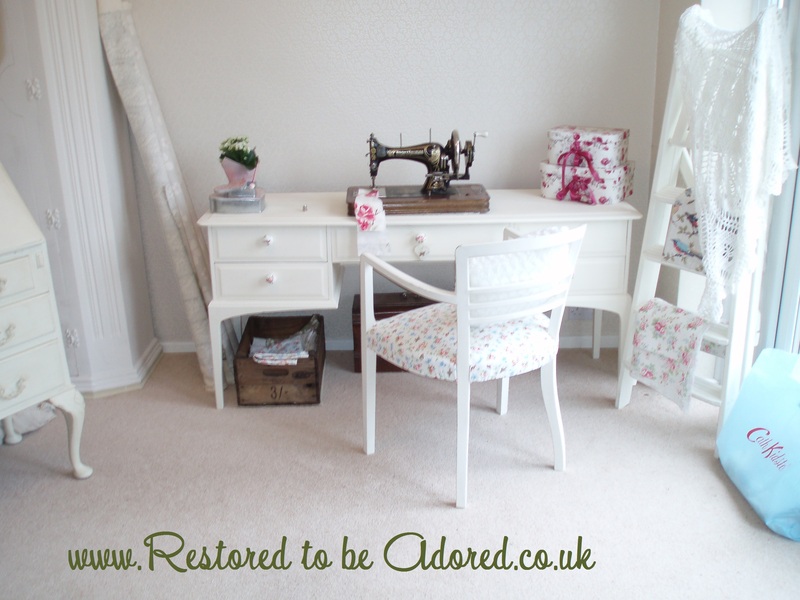 The matching Cath Kidston Chair shown is also available. As with all Restored to be Adored pieces this is not new or mass produced, it is a customised one off item that has been painted with care but without making it look new or perfect, as this would lose the character of the piece! You can buy with confidence I have received 100% positive feedback. I work in a smoke and pet free environment. FREE Delivery within 15 mile radius of Maidstone Kent ME16 (Ground floor only, no steps or lifts). Previous Post Painted Kitchens: why not transform your kitchen without spending a fortune?